Have winter fun like never before with a cool and functional sled. The 48-Inch Day Glow Two-Rider Sled from EMSCO Sports Products is the perfect snow sled for you The brightly colored Day Glow finish reflects off sunlit snow, lighting up in a fluorescent display as you speed down the slopes. Youll dazzle riders you as you rip through the snow in this amazing sled. And because its so bright, youll never lose it against white snow or a sea of other sledders. 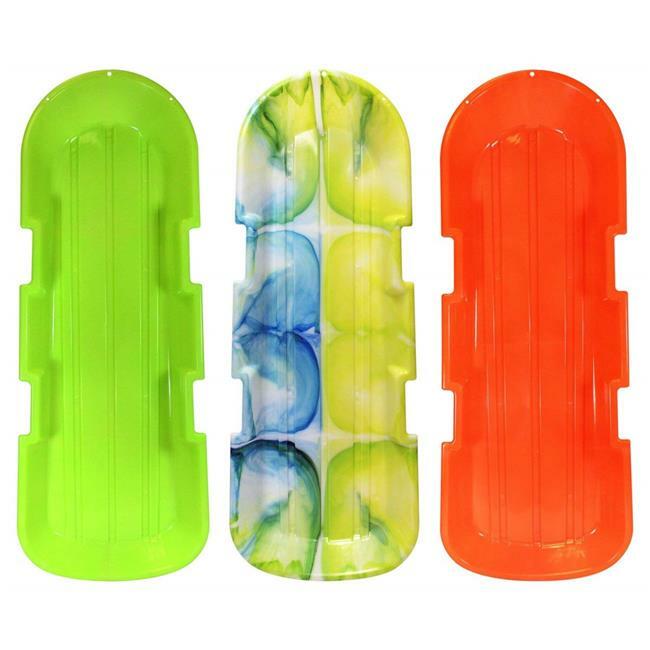 With this three pack, you've got all three Day Glow colors.Crafted with precision in the USA, this sled has a durable polyresin construction that is built to withstand heavy use. The sturdy structure resists impacts in freezing temperatures, making it ideal for cold, winter sledding. It features tracking rails designed to give you balance and stability when speeding down a snow-covered route. You can also ride this toboggan seated or laying down. The side handles feature an ergonomic design that facilitates a comfortable grip. The sled's bottom surface is diamond-polished for maximum speed in the snow. Additionally, this sled showcases a 48-inch structure to let you and your loved ones have fun together. This sled comes in a bright neon color, making it easy to spot anywhere.Enjoy amazing sled races with this heavy-duty toboggan and become winter champion of the hill with the ESP Day Glow Sno-Twin toboggan Sled. Sleds sledding snow kids plastic sled toboggan snow saucer tubing flexible flyer snow best cheap day glow Burton Caldwell DFT Caldwell Otter Ogio Bob Beavertail Lucky Bums ice EMSCO baby girls lightweight inflatable Shappell Zipfy Ejoy kid heavy duty Incra E-joy sport boys high-quality Whamo Titan youth adults Honeywell teens luge foam two person racer extreme 2 toy Christmas non-breakable.